Our local tomatoes start to ripen en masse just as August arrives. I just hauled home 12 pounds of slicing tomatoes and 2 pounds of cherry tomatoes from our CSA. Walking through the fields, I saw bounteous plum tomatoes that will be ready in a month and cherry tomatoes in weeks. Our home garden has transformed from a civil potager to a rampant jungle of tomato and cucumber vines. Luckily, I have about 10 varieties, mostly cherry tomatoes, but unluckily some are rogues that just spouted, signaling a potential disease scenario. My husband groans that the arrival of so many red and yellow orbs will be an unbearable invasion, asking if I would please set up a canning operation in the basement. What? In the basement? Yes, I am a tomato maniac. 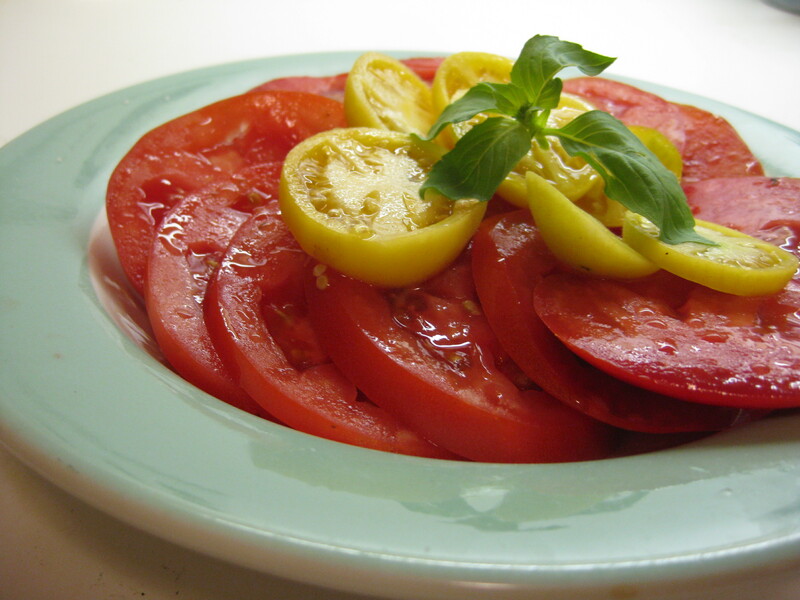 In season, I eat tomatoes at every meal, including breakfast. I can many dozens of jars of tomatoes in multiple forms: plain, sauced six ways to Sunday, soup and stew base, hot sauce that resembles harissa, sweet ketchup, chutney, jam, with enough production to keep us well fed all year until the fresh ones come again. My family has me pegged on this topic. Some combinations of our large and creative family have a tradition of giving handmade/homemade gifts at Christmas. Last year, my mother made lovely water-colored compositions that she turned into bookmarks. The rest of the family got to choose among ferns, flowers, and architectural scenes but mine was dedicated to me alone. 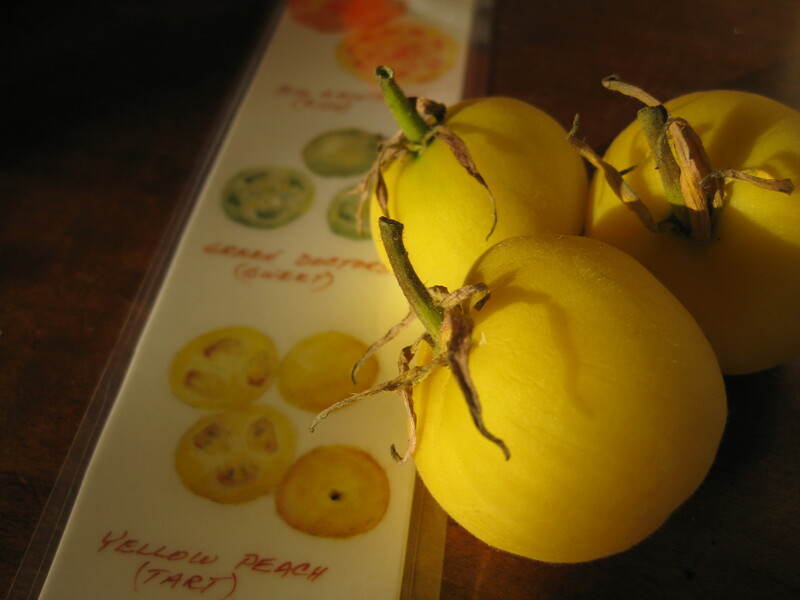 Labeled “Karen’s Tomatoes,” it depicted plans and sections of tomatoes called “Big Rainbow (rich)” and “Green Doctors (sweet)” and “Yellow Peach (tart).” I decided to grow these in my garden this year. The peach tomato was a new variety I had never seen: a slightly fuzzy orange-tinged yellow tomato that looks like a miniature peach. Tart for sure, and very cool, especially since the idea came from my mom. Love you!